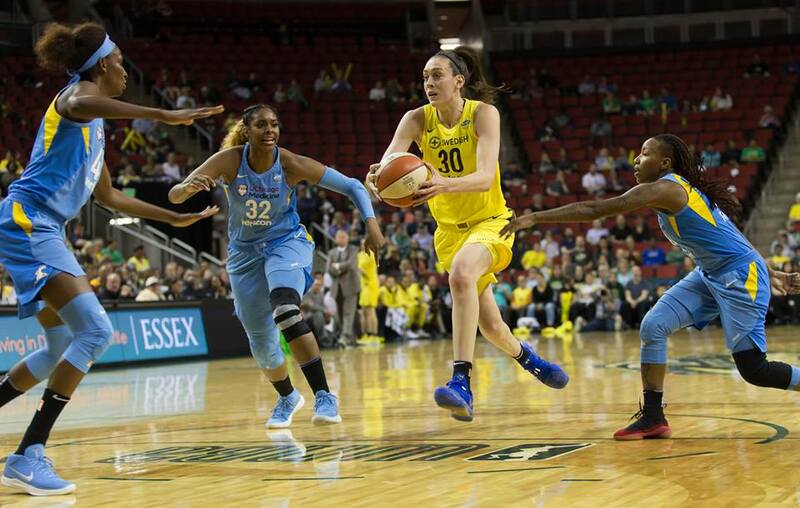 Breanna Stewart drives to the hoop. Neil Enns/Storm Photos. Seattle – Fool me once, shame on me. 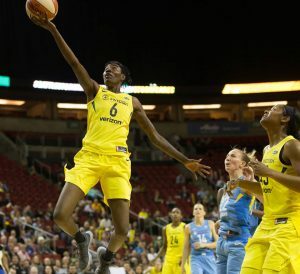 Fool me twice, however, and you just might be the Seattle Storm playing the Chicago Sky at KeyArena this season. For the second time in as many games between the two, the Storm erased a 14-point deficit at home en route to a 96-85 win Tuesday. 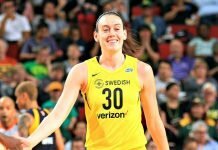 Breanna Stewart had a season-high 30 points for Seattle and Jewell Loyd had 19 on 8-of-11 shooting, while Diamond DeShields paced Chicago with 22. Much like their first tilt in May, the two teams played a near-even first-half, with the Storm taking a four-point edge into the break. Jewell Loyd goes up for two points. Neil Enns/Storm Photos. 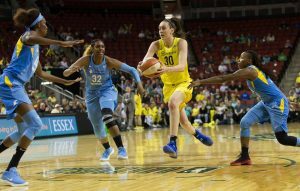 And again, the Sky — down a key contributor (this time Stefanie Dolson, after being without Courtney Vandersloot in the May 25 matchup) used a third-quarter run to pull ahead. The parallels aren’t absolute, though. This time, Seattle didn’t wait until the fourth to start making a run of their own. After trailing by as many as 14 with just over a minute left in the third, back-to-back three-pointers from Noelle Quinn and Kaleena Mosqueda-Lewis cut the deficit to single digits. That late spurt continued into the final quarter as part of a 20-2 run — holding the Sky without a field goal for more than five minutes — to retake the lead. Seattle ultimately outscored Chicago 31-12 in the final quarter, while shooting 12-of-16 from the field. Courtney Paris blocks Kahleah Copper’s shot. Neil Enns/Storm Photos. Storm head coach Dan Hughes gave credit to his bench, saying the three-pointers from Quinn and Mosqueda-Lewis gave Seattle momentum heading into the fourth. In fact, the entire Storm bench finished the night with a positive plus-minus. Natasha Howard takes flight. Neil Enns/Storm Photos. Seattle is back at home Friday for the third game in their longest home stretch of the season, as they take on league-leading Connecticut at 7 p.m. It’s a game Hughes says will be a “good measure” for his team, but, he’s not putting extra weight on the home stand. Rookie Jordin Canada left the game late in the third quarter with a left ankle injury, and did not return. Astou Ndour had a season-high 10 points and seven rebounds in 30 minutes of play for Chicago. Seattle finished with a season-high 48 points in the paint, besting the mark they set earlier in the year, against — you guessed it — Chicago (46). 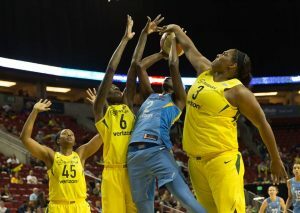 Crystal Langhorne missed her seventh game of the season on Tuesday, as she continues to recover from a right rib injury. She missed just seven games over her last 10 seasons in the WNBA. Mercedes Russell also did not play for Seattle (coach’s decision). In addition to Dolson, Alex Montgomery, Alaina Coates, and Linnae Harper did not play for the Sky.